Shot by Inez van Lamsweerde and Vinoodh Matadin, the new campaign continues the story that began with the AW2016 runway show at New York Fashion Week. Embracing organic imperfection, the raw industrial space signals a move away from strict precision and sharpness. Grounding the location in the world of the collection, columns in the colors of the season nod to a Bauhaus-inspired palette and architectural structures, both constant sources of inspiration for Wu’s designs. With a new sense of ease, ready-to-wear presents a marked evolution for AW2016. The tailoring DNA of BOSS is relaxed, allowing for softness and movement within the clothing, while technical precision and a dedication to craft remain key. Womenswear showcases ever-more feminine designs – a vibrant double cashmere coat and a raw-cut bouclé dress are all finished with perfectly cut cascade details. Menswear is also evolving: more youthful, slimmer tailoring; a sporty bomber paired with a shirt and tie; a sharp tailored overcoat loosened up with buffalo check. New accessories are created in this aesthetic. The icon of the collection, the BOSS Bespoke bag, returns in two interpretations. Its original architectural silhouette is adorned with a graphic layered patchwork, while the new BOSS Bespoke hobo features a curved shape and a hand-woven leather strap. Men’s accessories include a modern backpack with a sleek, clean design, a compact document case and unstructured holdalls in rich leather. 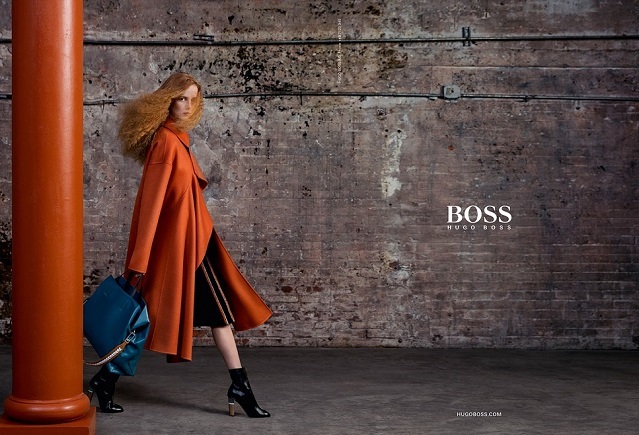 The campaign stars highlight this softer side of BOSS. Rianne van Rompaey, who opened the AW2016 show, brings a delicate beauty to the images, perfectly reflecting the new femininity that stands at the center of the AW2016 Womenswear collection. 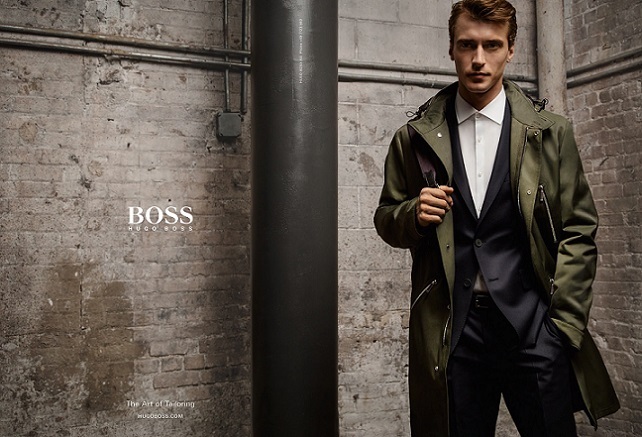 Now in his third consecutive BOSS campaign, Clément Chabernaud epitomizes masculinity and modern sophistication qualities completely in line with the vision of BOSS Menswear.